Christmas is a festival that manages to stir up a lot of passion amidst its festivities. One of the traditions that Christmas brings with it, in addition to setting up a Christmas tree, is building a Christmas Village. Christmas villages have their origins in German traditions and some can be admired in miniature house museums. What is a Christmas Village? 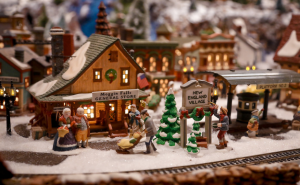 A Christmas village is a decorative miniature of a village that is set up in houses during the Christmas season. This tradition of setting up a Christmas village has been in practice since time immemorial. 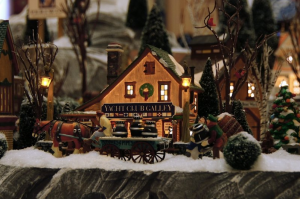 Christmas villages were normally made of cardboard, while porcelain ones were also to be found. How to Build a Christmas Village? Christmas villages were traditionally built under the Christmas tree. What started out as a simple tradition became more elaborated over the years. The following are some pointers for setting up a Christmas village. This should be considered as a guideline, and any village can be customized according to personal wishes and the homes we live in. The first step is to get a plywood sheet ready, which has been trimmed and cut to the required size of the village that is going to be established. A room or a place that is suitable for such a village needs to be selected. Small holes can be bored into the wooden sheet to insert electrical wires and other fittings. The wood needs to be covered with a clean white cloth or felt to replicate snow. Sidewalks and streets then need to be set up with houses lining the streets. The type of houses and the number varies according to each person’s individual wishes. Banks, post offices, schools, fire stations, small shops, churches and many more buildings that can normally be found in villages can be added to the Christmas village. Modes of transportation such as buses, cars and even trains can find a place in the village. Trees, some animals and small miniature people complete the set up. Groups of people standing and talking together in various areas would add to the festive atmosphere of the village. The whole village can then be coated with snowflakes to give a snow-dusted effect. Fresh moss is sometimes used to depict a cave, while sawdust is sprinkled to represent the roads that lead to the manger. It is to be noted that the buildings in Christmas villages are never made to scale. A house can be taller than a church or vice versa. The Holy family and shepherds are also sometimes placed in the village. The following are some of the ideas that can make your Christmas village stand out from the crowd. To save space Christmas villages can be set up in bookshelves, corner stands or on ladder shelves. Try to collect different buildings and pieces that are, importantly, proportional to each other to make the village attractive and pleasing to the eye. Many famous brands such as Department 56, Lemax, Hummel and Thomas Kinkade, roll out pieces for Christmas villages year after year. Pieces can be collected over subsequent years to make your village more elaborate. Artificial snow effect, real pine branches and train tracks with trains and appropriate lights will all make the village more special. Not only is village making a grand tradition, but it can involve the whole family, making it a fun activity that can promote a happy family atmosphere during the season of lights.